The Hague (AFP) – A Dutch-based student on Tuesday unveiled a prototype of an “ambulance drone”, a flying defibrillator able to reach heart attack victims within precious life-saving minutes. Developed by Belgian engineering graduate Alec Momont, it can fly at speeds of up to 100 kilometres per hour (60 miles per hour). “Around 800,000 people suffer a cardiac arrest in the European Union every year and only 8.0 percent survive,” Momont, 23, said at the TU Delft University. “The main reason for this is the relatively long response time of emergency services of around 10 minutes, while brain death and fatalities occur with four to six minutes,” he said in a statement. Painted in emergency services yellow and driven by six propellers, the drone can carry a four kilogramme load — in this case a defibrillator. It tracks emergency mobile calls and uses the GPS to navigate. Once at the scene, an operator, like a paramedic, can watch, talk and instruct those helping the victim by using an on-board camera connected to a control room via a livestream webcam. The prototype has already attracted the interest of emergency services including that of Amsterdam, the Dutch daily Algemeen Dagblad said. The Dutch Heart Foundation also applauded the idea, the newspaper added. Momont however wants his drone to become a “flying medical toolbox” able to carry an oxygen mask to a person trapped in a fire or an insulin injection to a diabetes sufferer. However, the drone is still in its infancy as far as developing its steering mechanism and legal issues regarding its use are concerned, Momont said. He said he hopes to have an operational emergency drone network across the Netherlands in five years. 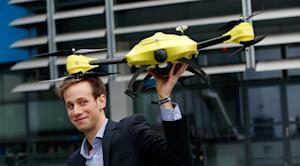 The drone is expected to cost around 15,000 euros ($19,000) each. “I hope it will save hundreds of lives in the next five years,” Momont said. The Small UAV Coalition advocates for law and policy changes to permit the operation of small unmanned aerial vehicles (UAVs) beyond the line-of-sight, with varying degrees of autonomy, for commercial, consumer, recreational and philanthropic purposes. Our members, including leading consumer and technology companies such as Airware, Amazon Prime Air, DJI Innovations, Google[x], GoPro, Parrot, and 3DR, believe that U.S. leadership in the research, development, and production of unmanned aerial vehicles will benefit consumers in all walks of life. We believe that, working together, we will be able to remove unnecessary policy or regulatory hurdles that impede small UAV development, sales, job creation, and services. For more information about the Small UAV coalition, check out their website: smalluavcoalition.org!